This 360 degree panoramic lens will help you. It can let your Iphone change to a panoramic camera immediately. With front and rear double lens and double 180 degree design, it is a real 360 degree panorama, recording your wonderful life in all directions. It features free app PanoClip to record video and stitches the data into a panoramic video/photo, support for real-time preview. Usually, mobile phone can only take a flat photo, no panorama, no space, no three-dimensional, then the photo you shared on Facebook or ins has no special place with others. Do you want to be unique and be the modern one on your social social application? This 360 degree panoramic lens will help you. It can let your Iphone change to a panoramic camera immediately. With front and rear double lens and double 180 degree design, it is a real 360 degree panorama, recording your wonderful life in all directions. It features free app PanoClip to record video and stitches the data into a panoramic video/photo, support for real-time preview. Get it and explore the wonderful world! 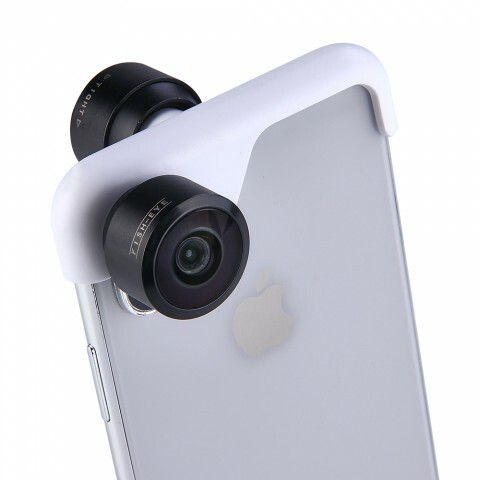 • Specially Designed for iPhone 8 Plus & 7 Plus: This VR Lens kit is designed specifically for iPhone X/iPhone 7 Plus/8 Plus/iPhone 7/8 only. • Turn iPhone To VR Camera: With just a simple clip, your iPhone instantly become a Panoramic VR Camera, it allows you to shoot 360 degree VR photos and videos at any place and any time. This portable gadget flavors your 360° photography with supreme convenience. • Portable: Designed as the tiniest VR lens for iPhone in the world, convenience to put in a pocket and ready to use in seconds. • Free App: Free app PanoClip to record video and stitches the data into a panoramic video/photo, support for real-time preview. • Premium Quality: Made of high quality coated optical glasses and strong aluminum construction, minimizes lens glare, reflection, and other artifacts. • Note: Please take off your phone case before clip on this VR lens and it does not work if you have tempered glass film on your iphone. 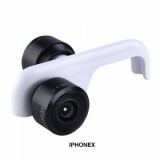 • Other Panoramic Camera and mini camera are also available in BuyBest. I have twin 13 year old boys and at times schedules cross and they are at home for short periods of time alone. I purchased this camera to keep an eye on them when this happens. It was very easy to set up and within moments I had a clear view of my living room on my phone. The best feature is that this camera is video and audio and its ability to begin recording when it senses motion. I not only see what my boys are doing I can also hear them and talk to them through the audio feature. When schedules cross or I need to run nearby errands I do not have to be concerned about what my kids are doing at home.. I just pull out my phone and take a look and listen!! Unbelievable! the 360 VR Videos are a new craze and I am very impressed with the video quality. I plan to use it as my default video device as I can re-live the moments in VR. Way more cooler than using the regular video camcorders. I'd definitely recommend this product . Unbelievable! the 360 VR Videos are a new craze and I am very impressed with the video quality. I plan to use it as my default video device as I can re-live the moments in VR. Way more cooler than using the regular video camcorders. Color picture is clear and crisp and you can angle it how ever you want....360 degrees. Easy to install and I did find using the QR Code Reader was the best way to go as opposed to using the app. The support team is awesome...responded to me promptly with easy to understand directions. For the price, this is a great camera and I highly recommend it. Perfect for me. No monthly charge. Works off of your in home wifi. Night vision is clear. bought this to keep an eye on inside my home as I am away. Sound is about 1 sec delay which is ok. Had this thing over 3 months now and never dropped connection. I highly recommend. It suits my iPhone 8 Plus well! amazing camera, I have never used Panoramic Camera before. Just take 15 days to arrive United States, GOOD SELLER!